After – probably – the longest winter in New Brunswick history spring has finally arrived! The robins are back, the grass is green, the buds are bursting, and the water levels are high. Fishing season opened here way back on April 15th, but winter pressed on. It’s May 10th and there’s still a couple of feet of snow in the woods in many places. 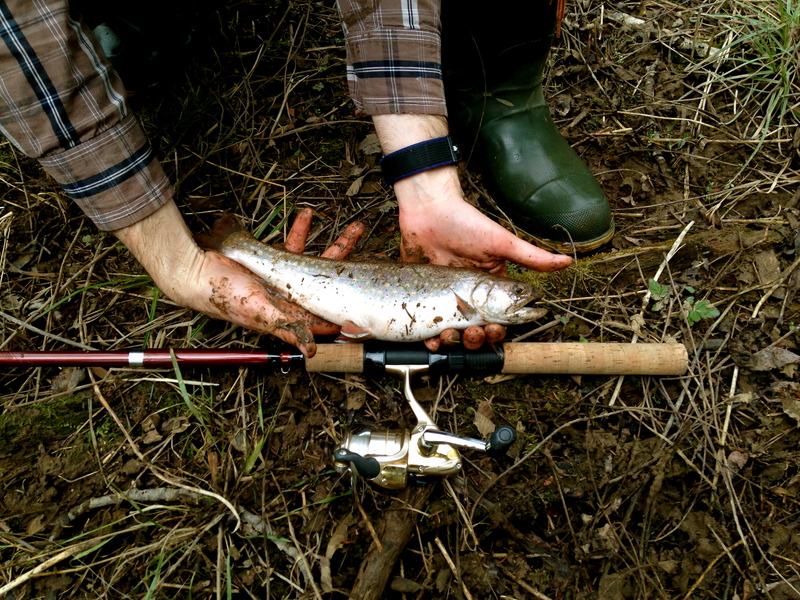 Consider this, I have been fishing on the Renous River on opening day – April 15th – in each of the last two years. This year fishing on April 15th surely would have resulted in certain death. Actually, last year nearly did too. Just as an aside on the importance knowing your limits. Last year on opening day I was wading out into a small channel of the Renous River and took one step too many. One extra step was all it took. In an instant ice cold water was rushing into my chest waders. A friend of mine was 20ft away and was powerless to do anything but hear me cry out “Oh man, I’m swimmin'”. Thankfully, I reacted quickly and was able to swim to shore before being pulled under and washed down river. But the message was received, respect the power of water and know your limits. This year, as April turned to May I still hadn’t had the opportunity to wet a line. With every passing day I grew more anxious. I started to feel like I’d never get to fish again. Mercifully, last Sunday a friend of mine suggested we go out and scout out some new spots. We settled on the Nashwaaksis Stream, just outside of Fredericton. Neither of us were that optimistic – we figured why bother driving for hours if we’re not going to catch anything anyways. I spent Sunday morning getting my gear ready. I Loaded up my fishing vest – struggling to remember what goes in which pocket – and rigged up my $20 telescoping rod with my expensive Shimano reel. I was a telescopic rod cynic for years but I could no longer ignore their potential convenience, so I purchased one last year. While they have many issues – e.g. the last guide is rarely straight, sections get stuck, they are cheaply made, casting performance is poor, the action feels uneven, they feel weak…etc – they make your life infinitely easier when hiking through the woods into a fishing spot. I suppose after years of getting rods/line tangled in branches or having to cary a rod case on long hikes, I was just trying to preserve my sanity. Also, considering that brook trout don’t typically get that big, I reasoned things would be ok.
We arrived at the spot in the early afternoon – of course I forgot my rubber boots – and started to hike in through the mature silver maple, willow, and alders. Signs of the spring flood were everywhere, the forest floor was covered in a layer of pale branches and large logs, grass and other debris had accumulated in the trees/shrubs 4-5ft off the ground, the water was high and murky, and large chunks of ice had been deposited randomly around the floodplain. Most of the snow in the area was gone, only remaining in the shadiest of spots. We stopped at what seemed like a nice looking spot and set up our rods. I have a favourite spinner I like to use for brook trout; it was given to me by a friend of mine on a day in which I was ill equipped for trout fishing. It’s nothing special – it’s plain silver in the willow leaf shape, about an inch long. The kind of spinner blank that allows you to build your own lure – they come in a 3 or 4 pack. I’d love to tell you that on the first cast of the year I hauled in a beautiful brook trout, but I’m not that lucky. Rather, the first cast of the year was just a quiet, serene moment. I was happy to have the cork handle in my hand, to open the face of the reel and hear the click, to watch the lure soar out over the river and land with a familiar plop, and to feel the tug of the river on the line. Fishing was back! I worked my way down river – casting across river at 45° angles and letting the lure work its way back across toward me in the current while slowly retrieving. After about an hour and a half we had nothing to show for our efforts. I noticed a small brook running into the stream a few hundred feet ahead – that I would have got to eventually – and decided that it was a spot I needed to try immediately. I set myself up just above where the brook flowed in and let one fly just into the water just above where the two merged. The perfect cast – I thought – but nothing. I kept casting into that same spot, over and over, hoping something would take the bait, but nothing. My mind started to drift – as it often does when on the water – I stared up river and watched my friend Shane cast and retrieve. I drifted further – still working the river from the same spot – and I wondered whether or not this will be the year that I finally catch an Atlantic Salmon. I was thinking about what that would be like, when I felt a tug on the line. I pulled up the rod tip – attempting to set the hook – and instantly felt the heavy, pulsating pull of an opposing force. I looked from the tip of the bowing telescoping rod down to the end of the taught line and saw a large, bright silver flash. I involuntarily barked “WHOAAA!” and I heard Shane yell, “is it a fish? !” I don’t believe I replied. Any time I hook a fish that I think is going to be memorable, there’s always a slight pang of anxiety. Concern about the being the guy telling the story about the one that got away. Never truly being able to verify the specifics, species, size, etc. Thankfully, I managed to keep my wits about me, I kept the tip up, kept the line tight and got the fish up to bank. It was a beautiful brook trout around 13-14 inches in length with a fat belly that was full of meal worms. Needless to say we were both in disbelief. We fished for another hour or so and caught nothing, but it didn’t matter. Here’s hoping the rest of the season goes this well – and that there’s a salmon in my future.